Fronted by ex. Cop Shoot Cop bassist Tod Ashley, New York's Firewater deliver their fourth full-length, The Man on the Burning Tightrope, a stripped-down, barbed-wire laced record from the self-proclaimed "wedding band gone wrong". Led by Tod Ashley's dark, guttural vocals, Firewater covers the gamut, from Klezmer and Vaudeville, to post-punk and pop-rock, creating a rock 'n' roll cabaret act that is as dark and disturbed as it is fun and entertaining. 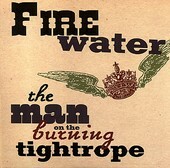 The Man on the Burning Tightrope is a sinister, delightful, and devilishly stylish record, one you can't help but dance and smile to while Goosebumps form after you pay attention to the lyrics. I'll give it an A-.